Great write up as always! I’m just curious about the I-485 inventory as of April 2018 that was released recently. It shows that there are several pending 485s with priority dates in 2018 (some even in March 2018). Does this mean USCIS approved some 526 in under a month? Also, specifically for India, it shows many pending 485s in the latter half of 2017 and early 2018, but nothing from before. Why might this be? I haven’t commented on those those pending I-485 reports from USCIS because I noticed them for the first time early this morning, but indeed the priority date detail is very interesting. (https://www.uscis.gov/greencard/pending-employment-based-i-485-inventory) Apparently USCIS is indeed approving some I-526 in less than a month. India may show few pending I-485 because Indian I-485 are approved fairly promptly upon receipt, so don’t stay pending. And/or USCIS is adjudicating petitions from different countries on a different schedule. OP : How is the i-485 inventory related to people’s priority date ? i-485 inventory is the month they filed i-485. How does one come to conclusion that Indian EB5 i-526 were approved in less time from i-485 inventory. So the i-485 inventory isnt actually the number of people who filed their i-485 in calendar month rather its the priority date of number of candidates ? that is one whopping confusion. Thank you again for this information , In published 485 data , I see numbers (Total 18) available for mainland china for year 2018 , How that can be possible since cut off data is already being enforced for this county ? @Rommy – 485 inventory is only for people in the US who are adjusting status. It does not include the vast majority of people who are applying for consular processing. Rommy — I’m confused now too. 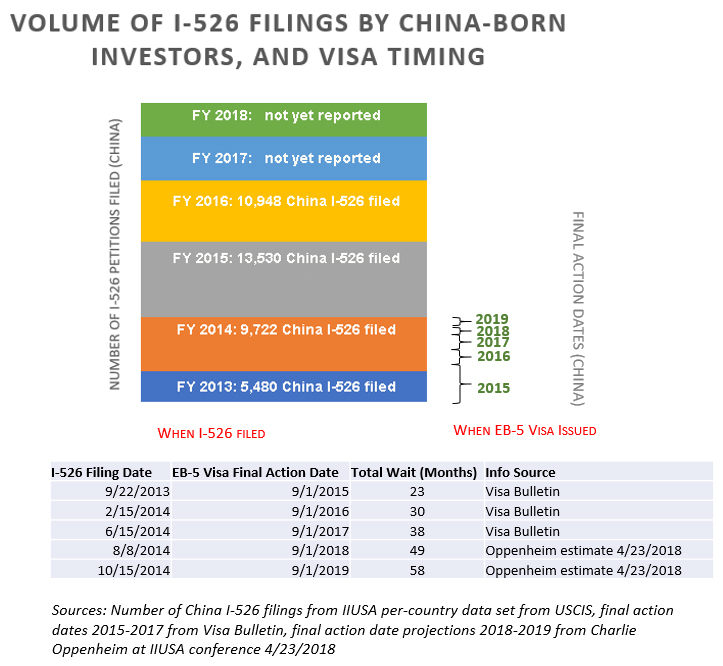 These I-485 reports just show pending I-485, not visas issued, but still it’s odd to see pending China I-485 for dates in advance of the cut-off date. I was forgetting I-485 can’t be filed until a visa number is available, as indicated by the Visa Bulletin. This Q&A from the FAQ may be relevant to the EB-5 category as well. Q: Why were there pending cases listed with priority dates after August 2007 when the Visa Bulletin priority dates was never beyond August 2007? I think the i-458 inventory numbers are Balloony numbers plucked out from thin air. Surely they cant be interpreted as anything but random numbers. I highly doubt that the numbers are any where close to being correct. I-485 cannot be filed unless i-526 is approved and these clearly are not i-526 approved + i-485 filed cases and neither are they i-526 approved numbers. Hi Suzanne, We have pending EB5 application on my wife’s name and I have my own approved I 140 in EB2 , In future if a cut off date applies to us , do you know if we can use my priority to her application to file I 485 ? Is there a possibility of this ? This question goes outside my expertise — a good question to ask the lawyers. @Rommy You cannot port your date from EB2 to EB5. On Approved EB2 , I am a primary, and on Pending I 526 , My wife is primary , still I can port my EB2 priority to hers I 526? Great analysis of the ‘results here’! Do you have a same analysis for I829 Google form? I haven’t yet set up a Google form to collect I-829 reports, but if you’d like to make one, or know of one, I will publicize it. I can contribute your format while doing the survey I mean. Thank you! Great work, I am wondering that as USCIS has picked up the pace on I-526 adjudication, so applicants from other countries’s approval process will be faster? I am from Pakistan and submitted my petition on Dec 8, 2017 in approved exampler project. I can’t see enough of a pattern in recent processing times to make predictions, but certainly some people are getting relatively fast approval. Hope you are one of the lucky ones! But best prepare to be unlucky, just in case. Thank you for sharing such important and real-time information! I have a question regarding taking 15 years to issue conditional green card to China investors. Does it roughly mean priority date plus 15 years would be the time for us to file Status Adjustment even if the priority date goes back to Sep 2015? In other words, early priority date by and large would not get less waiting time than 15 years? I didn’t hear Charlie’s quote for myself, but I’m sure he didn’t mean that. Within a country, people get visas in order by priority date (once they’re documentarily qualified). So someone from China who filed in 2015 will get a visa long before the China-born investor who filed in 2017. I assume that Charlie’s wait time estimates were for people filing now, but welcome insights from anyone who heard the Q&A live. Thank you Suzanne. Can I assume the estimated years to grant visas or all people already in the system from your model is not impacted by priority date? That’s correct. I fainted at the prospect of making a model that would calculate by priority dates. But I hope someone will make a model that allows for individual predictions. Suzanne, thank you for nice update. Can I ask to predict when is the highest possibility to receive approval for petition filed in June 2016 by UK citizen? I hope it’s summer 2018? I understand it’s not certain, just highest possibility? Just based on dividing pending petitions by average adjudication rate, I would indeed expect probability to favor Q2/Q3 2018 approval for a petition filed at the end of Q2 2016. Thank you Suzanne for your wonderful analysis, I am an investor from Vietnam filing I-526 in May 2017, I was disappointed that Vietnam is now in the backlog due to recent increase of petitions. Your tabulation shows that in early of fiscal 2019 year we will be out of the backlog and soon come back to the stagnant waiting list again. Could you predict how much more time I have to wait to get the Visa with the assumption that my I-526 petition is approved after 2 years of filing (hopefully I-526 approved in May 2019). 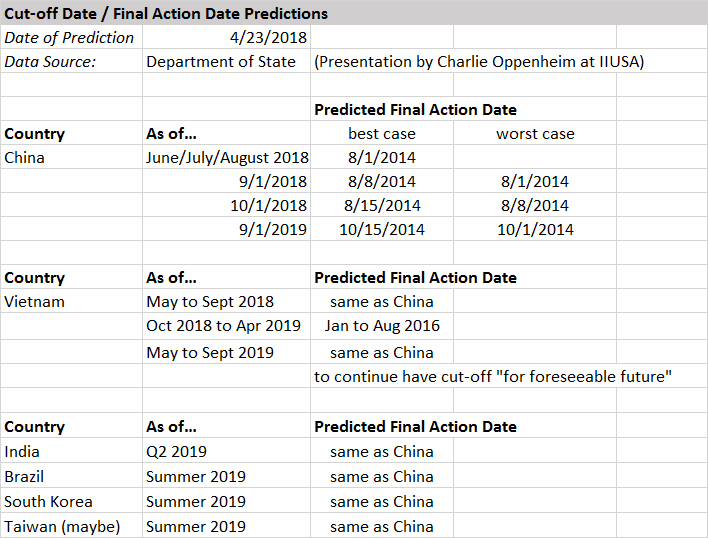 Can you guess the Final Action date for Vietnam by October 2019 and so on? Thank you Suzanne for excellent content here. I’m looking for specific data that i couldn’t get. Is there an accurate/predicted number of I-526 applications for India & Vietnam for FY17 & FY18* (6 months) available? I see the FY15 & FY16 I-526 application count in your blog. For India it is 239 & 354 for FY’15 & FY’16. Similarly for Vietnam it is 289 & 404 for FY’15 & FY’16. 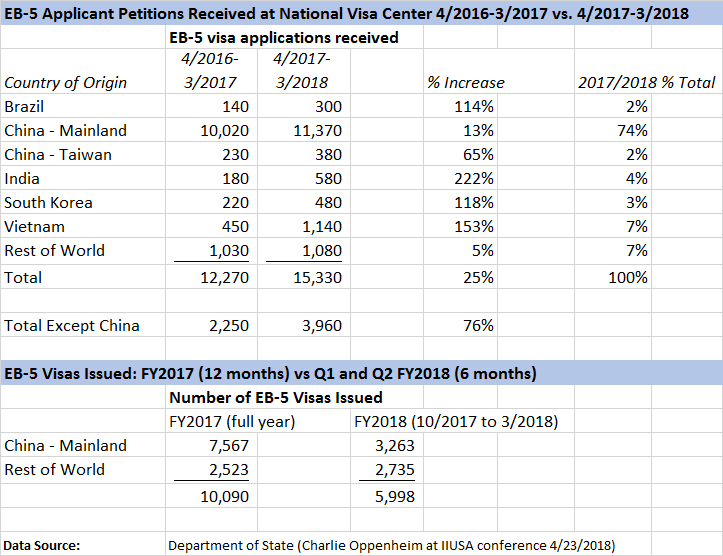 If i have the count for I-526 application, I could further try to predict Visa demand for both India & Vietnam and hence the impact for FY19, FY’20, FY’21, FY’22. Based on analysis, it would help understand the impact of applying EB5 today. This data would be great to have, but we depend on getting it from USCIS via Freedom of Information Act request. I’m sure IIUSA has a FOIA request pending, but those can take a long time to process. Alternatively, you could follow the news about EB-5 in India, and the size of projects being promoted there, to guess at the number of petitions likely being filed. Most Indians who are applying are already in the US on H1. This is the trend we are seeing in our telegram group. Based on the video (around 11m.30s), it seemed that Charlie Oppenheim said the final action date for India will be enforced “no later than June, potentially earlier”. It your doc, its say Q2’19. Is there more background information or am i missing something? I’m told that in the Q&A period, Charlie clarified that he meant June 2019, not June 2018, for India. Could you publicize this in a new post ?We have a telegram group that has grown to 95 members in just 45 days.. Please do the needful. It will be of immense help to new and potential investors. I wonder what is going on with monthly processing times updates? Did they forget about them? Or made some mistake in new website system and now it does not work properly? Can we let them know that there are no updates? Maybe they don’t know? Thank you. They must know that they’re free from the burden of intentionally updating processing times. I bet they’re congratulating themselves on this clever system, with a date range so broad that it will be generally applicable for a long time, and an automatically advancing case inquiry date. Stats are out for first quarter. Processed less i829 than received which means a further delay. Will be over 3 years by the end of this year if it keeps going like this! Thank you for the maintaining this blog, it is by far the most reliable source for eb5 policy related unbiased material. In the fourth bullet point, you noted that India is expected to have a final action date by June 2019 at the latest. The video of Charles Oppenheim speaking at IIUSA that you shared a Dropbox link to (minute 12 onwards) seems to suggest that he meant June of this year. Is that your understanding too, or could I be misinterpreting that? I’m told that Mr. Oppenheim clarified in the Q&A period (which is not in the video recorded for me) that he meant June 2019 for India.